IDF and US Army complete the joint Juniper Falcon 2019 military exercise. 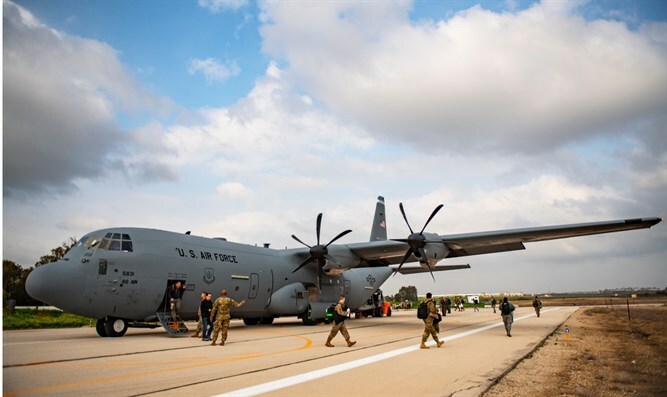 The IDF and the US Army on Thursday completed the joint Juniper Falcon 2019 military exercise, which included rehearsals of various scenarios in which US troops were deployed to Israel to aid in missile defense operations, including against high trajectory fire on the State of Israel. 300 soldiers from the US Army, together with about 400 soldiers from the various IDF units took part in the exercise, which included the absorption of heavy American aircraft, the deployment of infrastructures and the operation of joint means of communication. Brig. Gen. Ran Kochav, commander of the Israel Air Force’s Air Defense Division, said, “The exercise reflects the depth of relations between the two countries and the sharing of professional knowledge between the systems and the corps." “The objectives of the joint exercise were to increase the coordination between the armies, to practice orders and procedures in times of emergency and to deepen the familiarity between the forces,” added Kochav. “This year's exercise focused specifically on our ability to deploy forces quickly and combine them with IDF forces to provide support for ballistic missile defense, emergency supplies, disaster response and humanitarian assistance. It has always been a challenging exercise, but the lessons learned will help the two armies continue to strengthen relations between us and our combined capabilities in ballistic missile defense,” concluded the American commander.